As usual, I’m cycling to work. On this day my fingertips are numb upon arrival. But as I walk to the locker room I notice — of all things — sweat! What’s not to love about bike commuting? Every ride offers different sensations and constantly changing scenery. I save money. I exercise. I don’t have to wish for physical fitness. It’s built into my daily commute. I have to get to work in the morning and home in the evening. Why drive when I can pedal? I’ve often wondered: Why don’t more employees bike to work? I’ve come to believe that perceptions — of safety, time, and appearances — keep people off their bikes. Is It Really Safe To Ride In Traffic? Since 1991 I’ve made more than 9800 trips. Many of these were on big and busy roads. More than 1100 of my trips were after sundown. Dangerous, right? Wrong! In all these years I can say I’ve had just two close calls. To demonstrate how unusual such an event is, I’ll detail the first — which is seared in my memory, even though it happened decades ago. 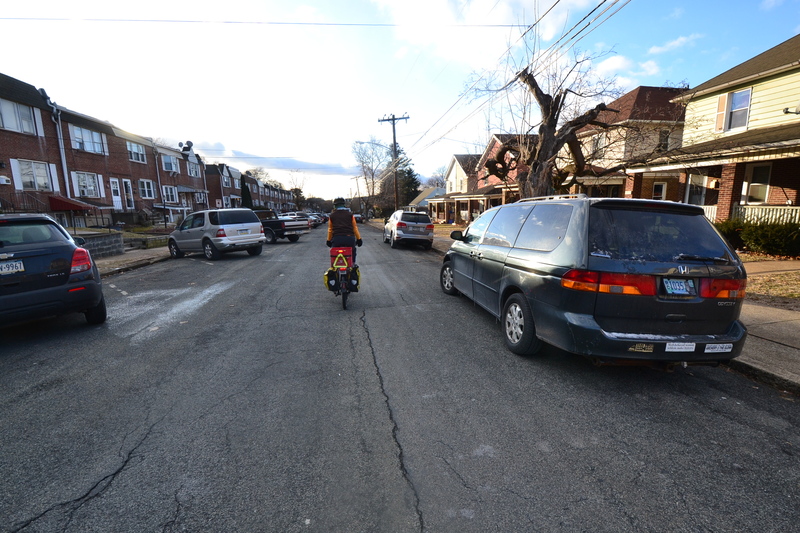 On a quiet suburban street in 1997, I was towing my 8-year-old and 5-year-old to school in a bicycle trailer. We were behind a large pickup truck belonging to a commercial landscaper. The truck stopped mid-block. We stopped behind it. Then the driver put the truck in reverse! Nothing bad happened except for me yelling out “STOP” at the very top of my lungs while quickly scampering aside with my rig. The truck driver and I then spent a few minutes consoling my sons. They’d been upset by my yelling, not the traffic situation. Since then, whenever I have to stop behind a truck, I first merge to the left side of our common lane so I’ll be visible in the driver’s side-view mirror. That way, what happened once in forty years is now a lot less likely. I learned that safety technique by experience. But you don’t have to make my mistakes! CyclingSavvy was designed to help you avoid the School of Hard Knocks. I wouldn’t ride if it weren’t safe. For me, 68,500 miles of bicycle commuting has been safe and provided physical fitness. And it was cheap. Timewise. From 1991 to 1998, my route to work was 8.7 miles each way. My transit time on bicycle was typically 35 minutes. I had motored that same route for a couple of months in the winter of 1990/91. The transit time by motor vehicle was typically 20 minutes. Why is motoring only 1.75 times faster than pedaling? The local road system with intersections, stop signs and traffic lights acts as a slow pass filter. 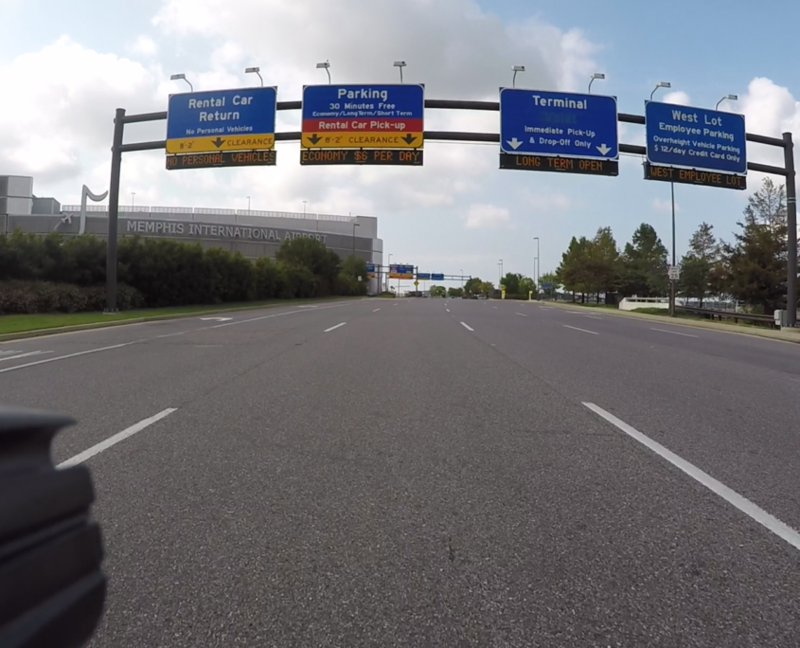 When I used Allentown’s Airport Road, motorists passed me doing 45 mph. 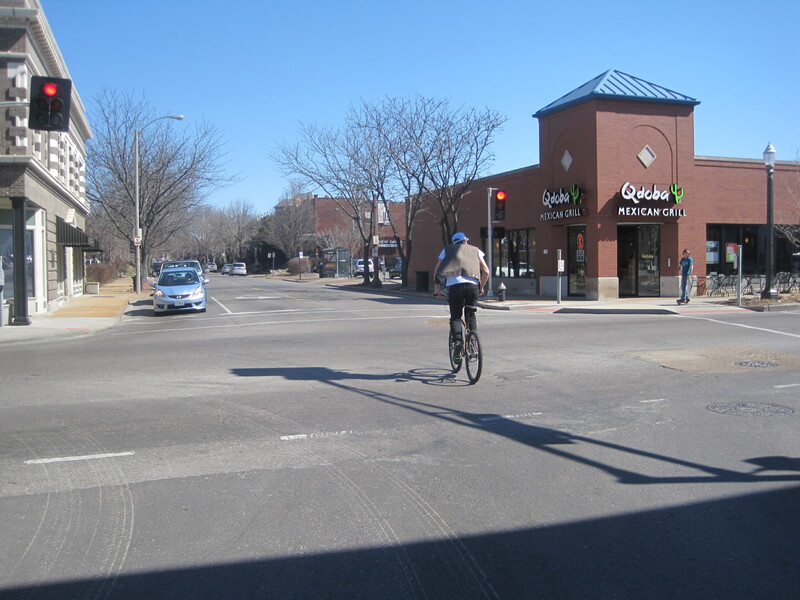 Often, I pedaled up right behind them at the next traffic light. Regular bike commuters know this phenomenon well. You’ll have several stretches on your commute where you and the fastest motorists cover the same distance at the same time, therefore having the same effective average speed. Bicycling is still done at low cruising speeds. If you’re going any distance at all, it probably will take longer to ride. But is it that much longer? And should time be your only consideration? In 1984 I bicycled to work occasionally. My route then was 12.5 miles each way. I love to bicycle so much that I still consider that distance optimal. 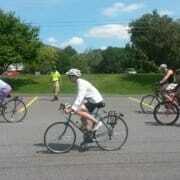 Biking time was 45 to 50 minutes. Motoring time was 25 to 30 minutes. The average US commute time is 25.4 minutes. 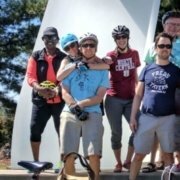 So most US employees live close enough to bike to work. Bicycling will be slower. But you’ll be getting good exercise during every minute of the short overtime. Safe. Good exercise for just a slight time commitment. Smart. 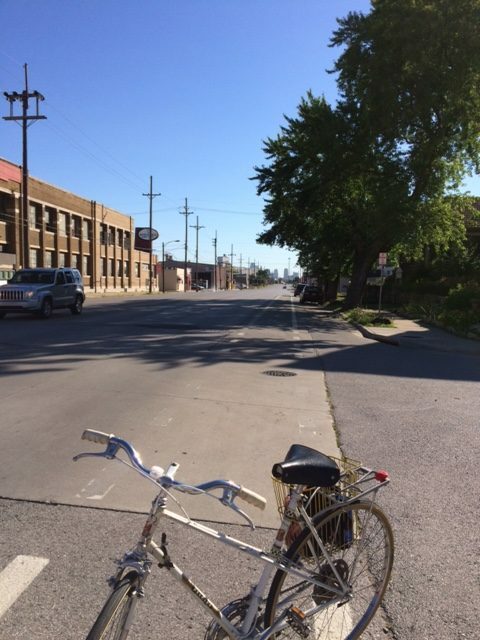 A third reason many employees don’t bike to work is appearances. 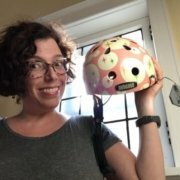 Does biking to work appear unwise? Once you understand the truth about safety and relative travel time, there’s nothing dumb about biking to work. Rather than sit at your desk and plan a run after work, at quitting time you can bypass the parking lot and have to exercise to get home. And still enjoy the ride. Bicycling can be taken up no matter what shape one is in. Bicycles can support any weight. Special bikes and accessories are available for special situations. 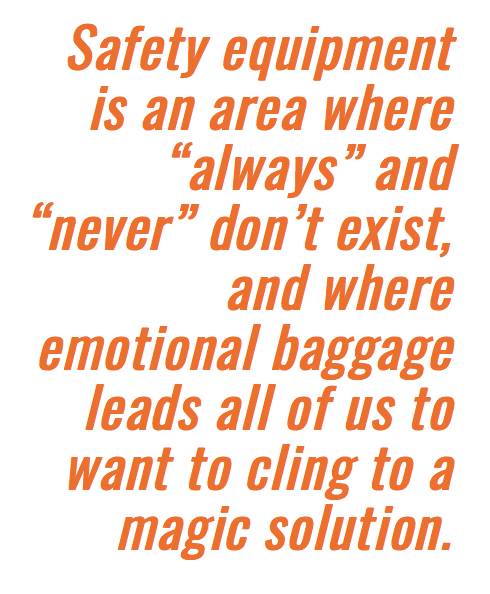 Best safety practices can be learned quickly — and tested and refined on your route. As time goes on, you’ll be amazed at how distances “shrink.” What used to seem far and intimidating becomes easy and routine. A major social objection toward US bike commuters is that they might slow down motor commuters. Sure, this happens sometimes. But this perception is way out of proportion to reality. There are times when a motorist has to wait behind me for an opportunity to pass. No doubt some of those motorists grumbled to themselves: “14.7 mph on Airport Road is ridiculous!” But see again the example I gave above. He’ll pass me. Then there’s a fair chance I’ll pedal up right behind him at the next traffic light. He might be third in line; I’ll be fourth. Therefore, I did not delay him. Had I been using a motor vehicle, I would have wound up ahead of him still at that light. 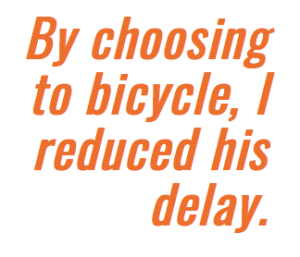 So by choosing to bicycle, I reduced his delay. Regular exercise. Safe exercise. Low-cost exercise. That’s how I feel the moment I push off every workday morning and evening. Smart. Even when T=17F. 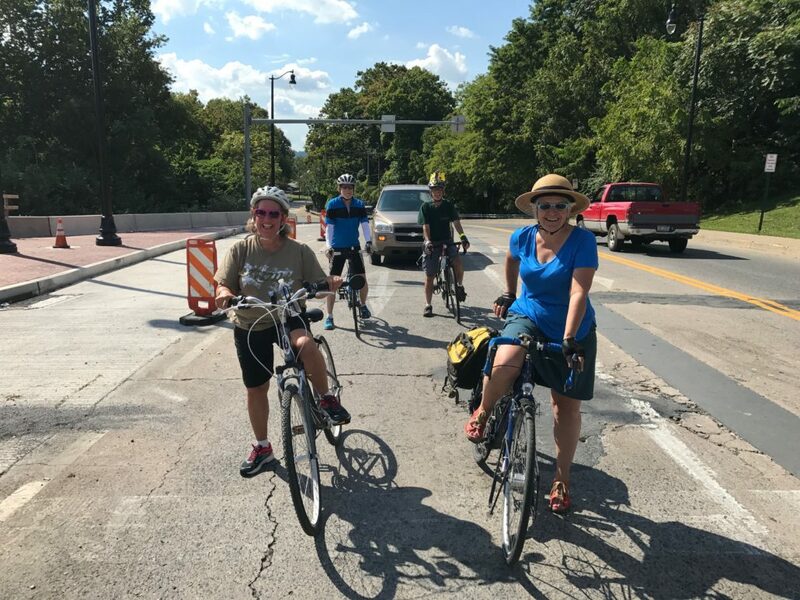 CyclingSavvy is “Empowerment for Unlimited Travel.” We mostly think of this as removing obstacles so we can cycle anywhere, but CyclingSavvy also empowers us to cycle any time, any day or season. 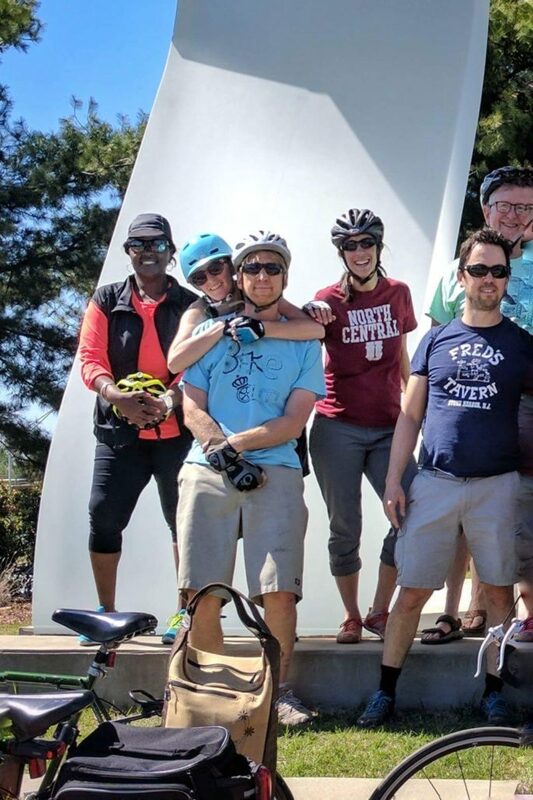 While many of our friends in southern latitudes are getting their bikes out after a hot summer, cyclists up north are putting their bikes away for the season. It doesn’t have to be that way! When cold weather threatens to keep you off the saddle, tell Old Man Winter you can take anything he can dish out and still get to your destination under your own power. I’ve been cycling to work year-round in Michigan for many years now. With the right equipment and savvy cycling skills, my commute is stress-free. I get to my destination refreshed, warmed up, and ready for the day. Winter streetscapes are totally manageable and have a magic of their own. There are of course unique considerations when the temperature drops lower than would be comfortable in your lycra shorts and jersey. As they say in Norway, though: “Det finnes ikke dårlig vær, bare dårlige klær” (“There’s no bad weather, just bad clothes”). We can extend that to other equipment as well. If you plan ahead with the right gear and the right strategy for how and where to ride, Jack Frost can go nip at someone else’s nose. Lights. Remember that the hours of darkness are long in the winter. Also, the weather can change quickly. Don’t leave home without good lights! You’ll want lights strong enough to see the pavement in front of you. Your lights should make you look like a motorcycle from the front, and slow-moving vehicle from the rear. Point your headlight slightly toward the ground, so that you don’t blind oncoming drivers. If you use USB-rechargeable lights, make sure they’re fully charged. Regarding batteries: Alkalines won’t work well below freezing, but lithium primary cells like Energizer’s Ultimate Lithium are good down to that unique temperature where Fahrenheit and Celsius are the same (-40). 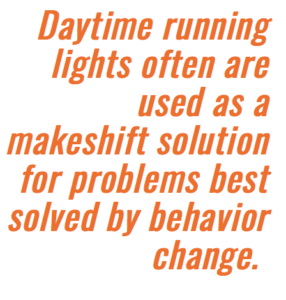 It’s a good idea to have “redundant lighting” (two headlights and two taillights). 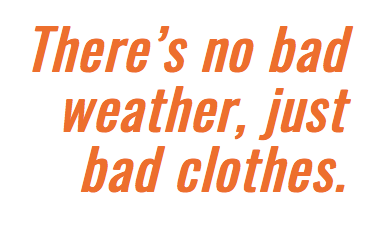 You don’t want to be fumbling with batteries in the freezing cold. Tires. If there’s any possibility of encountering a patch of ice, consider investing in studded tires. Clothes. Wind is the big enemy. As long as you’re protected from that, you’ll likely be able to generate enough heat to keep comfortable. The trick is covering your face, ears, hands, and feet. There’s an impressive variety of masks, hats, gloves and shoe covers available to meet the need. Dress in layers, and find out what combination works best in which temperature ranges for you. Lane position. Drive your bike where other vehicle operators are driving their vehicles. Not only does this make you visible and relevant, but it also puts you in a position where other road users have cleared a path on the pavement for you. 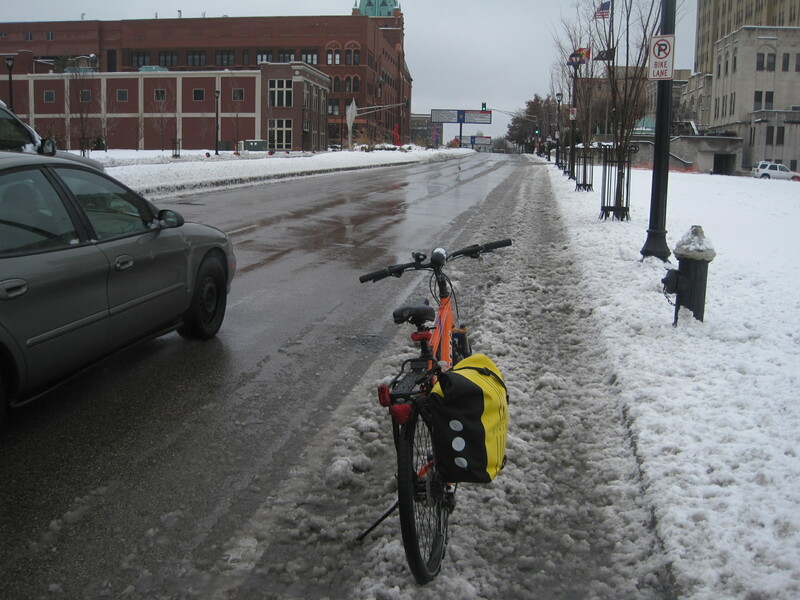 Bike lanes may not be plowed in the winter. Route. When there’s snow on the ground, the plow crews prioritize the main roads and school routes. Counter-intuitive as it sounds, it’s usually best to ignore Robert Frost’s advice. Take the road more traveled. As with lane position, this provides the best and cleanest surface to enjoy. There’re many more nuances and details, but those are the basics. 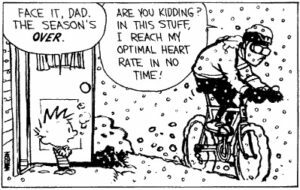 If you live in Michigan, Maine, Montana, Minnesota, or some northern state that doesn’t start with “M” and are ready to give winter biking a try, contact me or your local friendly CyclingSavvy instructor and get Empowered for Unlimited Winter Travel! We all have stories. 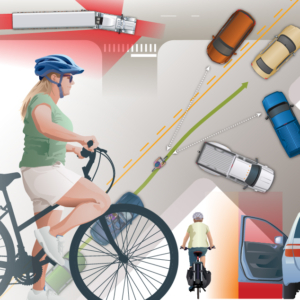 When it comes to bicycling, they are all too often negative. 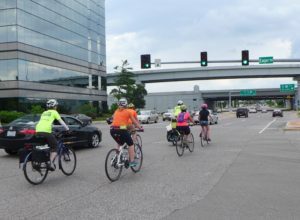 Bicyclists gripe about motorists, motorists gripe about bicyclists, media outlets play up the conflict with an endless stream of “bikes vs. cars” stories, and social media magnifies all of it. It can get downright discouraging. Too frequently, it’s these negative stories that stick with us. We remember the one motorist who honked at us, and forget the other 99 who passed us safely with no drama. But not only do we get a great majority of drama-free interactions, we also sometimes have good interactions! At least I do. I hope you do too. Let’s try to remember some of them. To start, there are many positive situations that happen too often for me to remember specific instances. For example, I may need to hold back a motorist in an unsafe passing situation, then release them afterwards. 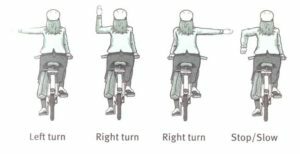 If I have held them back with the CyclingSavvy “stay back” gesture, left arm diagonally downward, palm back, I like to release with a friendly wave. That’s usually the end of the situation. That typically happens up to a half dozen times on my 5-mile commute. If they’ve had to stay behind me a longer-than-normal time, I try to make my gratitude more pronounced by not just waving, but turning my head and mouthing “Thank you” as I wave. Occasionally, I’ll be rewarded with an obviously friendly short beep. A few weeks ago, I even got a thumbs-up! That reminds me of at least once in the past when someone slowed next to me after a turn to say he appreciated that I knew the hand signals and used them. We talk about this kind of communication a lot in the CyclingSavvy classroom session. I like to say that communication is the most useful thing that most cyclists never do. One of the things motorists sometimes say they dislike about cyclists is how often they seem to be oblivious to what is going on around them. While I think it’s probably not always true that they’re completely oblivious, many do seem unaware of how much communicating would help the situation. They are shy about interacting with motorists, or don’t even know how. A motorist thanked me for preventing him from making an unsafe pass on this road! I always try to tell the story in my classroom presentation about my trip to a seafood restaurant in a nearby coastal town, which I blogged about here a few months ago. 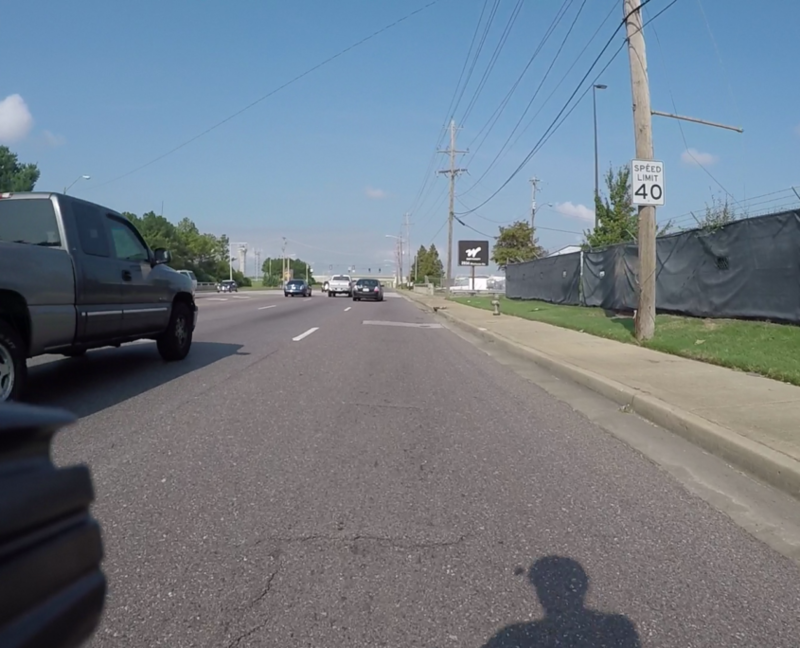 Spoiler alert: The motorist behind me for 1/2 mile or so actually thanked me for actively holding him back when passing was not safe, and of course releasing him when it was. 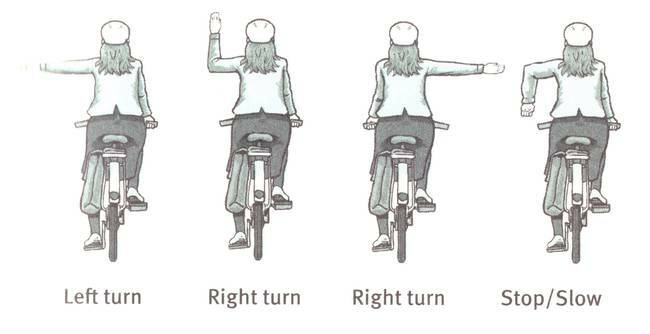 In a recent conversation about this topic with my wife, she said that whenever she happens to be behind me on my bike when she’s in her car, she appreciates how clear I am about my intentions, by my lane position and signaling. I’ve had several other people say the same thing over the years. 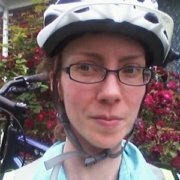 From the opposite perspective, someone told me once that what she finds most difficult about dealing with cyclists on the road is not getting any indication from them of what she’s supposed to do. 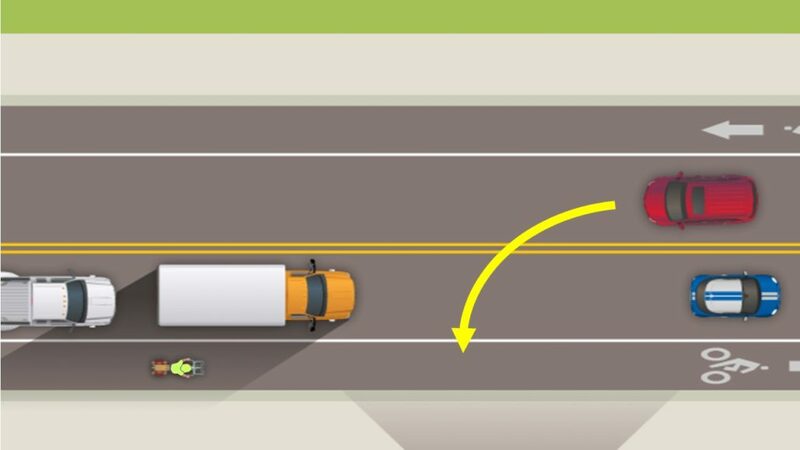 I think part of that confusion is how many cyclists hug the edge as close as they can even in an unsafe passing situation, subconsciously tempting following motorists to do just what the cyclist fervently hopes they don’t. Ever since I heard that, I’ve tried even harder to be clear in such situations. Sometimes we can read too much into a situation. 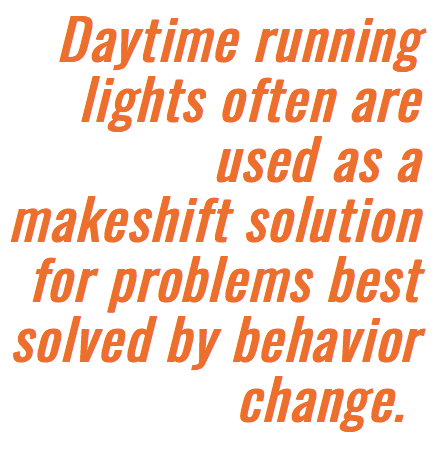 For example, we’ve all experienced motorists gunning their engines as they pass. It always sounds aggressive, like they’re expressing impatience towards us. But years ago, someone on a mailing list pointed out that it could just be that this is the way engines sound when the driver is trying to get back up to speed quickly, especially if they are going uphill. Maybe, just possibly, it’s not about us! Closely related is the common aphorism which I would express in this context as: “No need to attribute to malice that which can be adequately explained by carelessness or misunderstanding.” Sometimes the motorist may actually be unaware of what they did. Pursuing a discussion with a motorist is often unproductive, but on occasion, it has ended well. 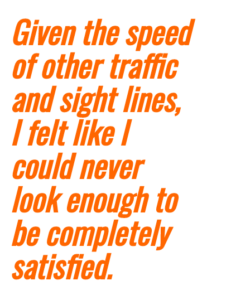 Two months ago on a 4-lane road, a motorist passed me somewhat closely (not completely in the next lane), at what felt to me to be a high rate of speed. I admit that I was ticked off enough that I kept an eye out for the distinctive pickup truck, and saw it in a parking lot a few blocks up. I decided to approach it, and the driver was still sitting in it, so I calmly asked her about it. She was unable to tell me how fast she was going, but was very apologetic. She explained that she had been the second car behind me, and didn’t realize I was there until the car ahead of her changed lanes to pass, so she was a little startled. She then told me that she used to ride a motorcycle, but stopped after having gotten in a crash. I still feel she could have been more careful, but she apologized multiple times, and we left on good terms. I hope she is more careful in the future. Once a “student driver” car passed me and did something I didn’t like, I forget exactly what. Maybe passed a little close, or honked. I happened to catch up to them at the next light and asked what that was about. The teacher in the passenger’s seat said that they hadn’t meant anything bad by it, and that I certainly had the right to be riding where I was. Another time two guys in the car I caught up with at their apartment building lot told me that as a bicyclist, I had more right to the road than they did! That’s not exactly correct, but I’ll take it. His wife’s car? If so, he was certainly proving her point! Maybe he was already put out by having to drive her car around with that sticker on it. 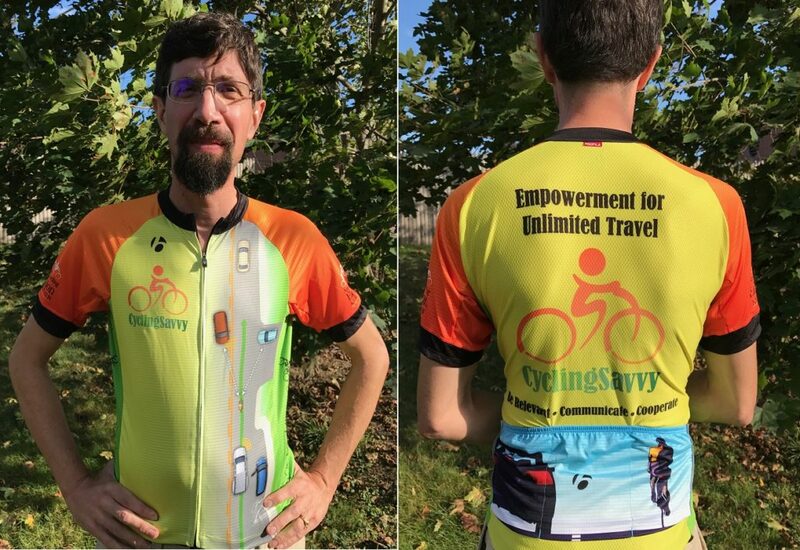 John Brooking modeling the new CyclingSavvy jersey. If you would like one, consult the sizing charts at hubbubonline.com to determine your size, then email Gary Cziko at gcziko@gmail.com. They are fitted jerseys, so you can order a size or two higher if you want a more relaxed fit. It was a Friday night of a holiday weekend. I was on my way (by bike, of course!) 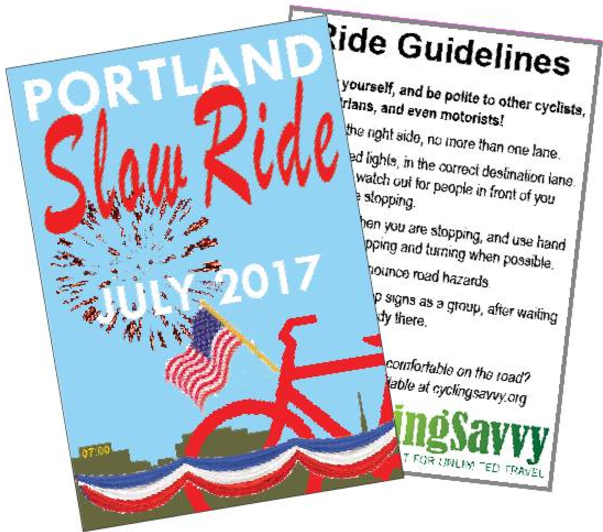 from my suburban office into downtown Portland, Maine, to lead July’s First Friday Slow Ride. The sun was out, temperature perfect, and traffic not terribly congested. I was in a good mood. The first half of this trip is on a four-lane arterial called Outer Congress Street. Because of narrow lanes and paved shoulders ranging from sketchy to none, I was riding in the middle of the rightmost travel lane to give myself space. This also helps motorists behind me know well in advance that a lane change will be required. Most motorists don’t even take their feet off the gas to change lanes to pass me. I’ve written before about one section of this road. I sometimes get guff here from motorists because the paved shoulder is generally four to five feet wide and next to a curb. What they surely don’t see are the drain grates, or the trash on the shoulder. 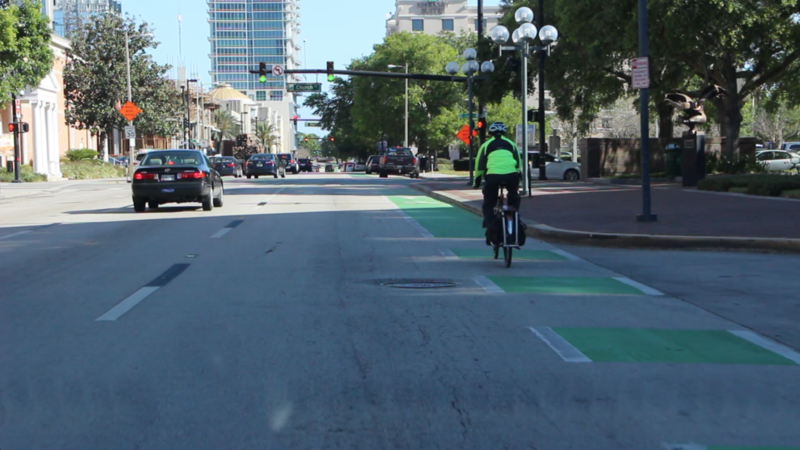 It must look to some drivers like a bike lane. It’s not. It’s too narrow, with no pavement markings or signage. The road during our conversation. 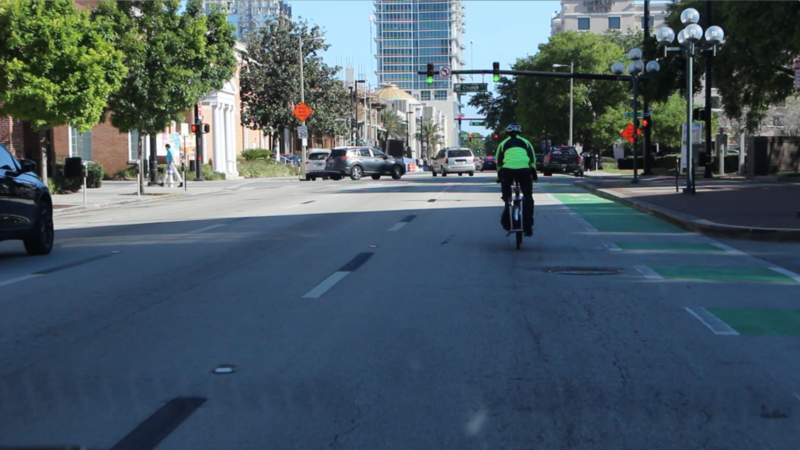 The upper left shows the paved shoulder that that the motorist probably assumed was “the bike lane.” The bottom right is where I heard him make the call. It was in this section that an older man driving a pickup truck in the lane next to me first slowed to my pace and then told me I needed to move over. I replied that I did not. We went back and forth a few times before he drove on. 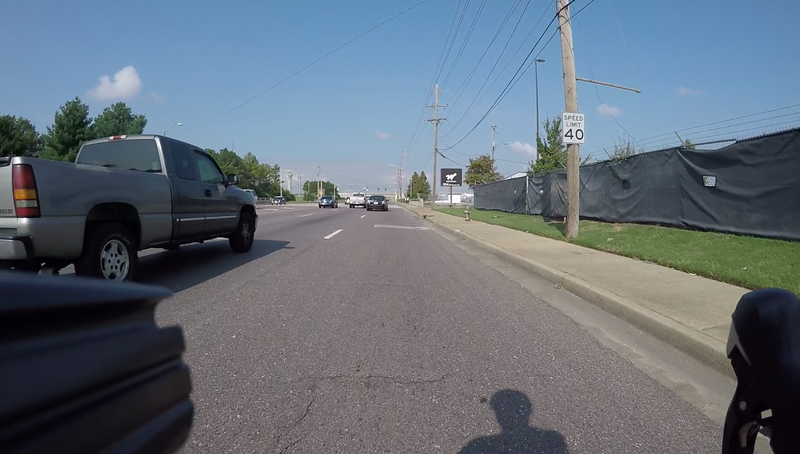 Shortly thereafter he moved into the right lane ahead of me and turned right. No cussing, no honking, no close pass. It went well, as such encounters go. The road he turned onto came back out to the main road another mile up. To my surprise, there he was again, waiting to turn right back onto the main road as I approached. I was close enough that he waited for me to pass before turning. Thank you! But then he came up on my left again. Again he insisted that I needed to move over. This time he threatened to call the police. Another mile up the road I approached a red light and got in line in the through lane. Who did I notice on my left, in the left turn lane, but my friend the pickup truck driver. His passenger side window was down. I could clearly hear him on his phone, telling someone about this guy on a bike in the “middle of the road.” He just wanted them to know about it, “in case he gets hit.” Thanks. I think. I didn’t say anything more. The light turned green, and we went our separate ways. Thankfully, no police car ever appeared. I turned off that road another two miles up, and that was the end of it. 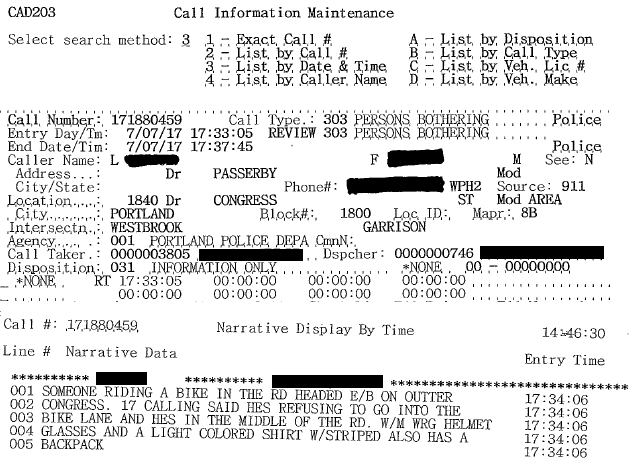 Official police summary of the call about me. 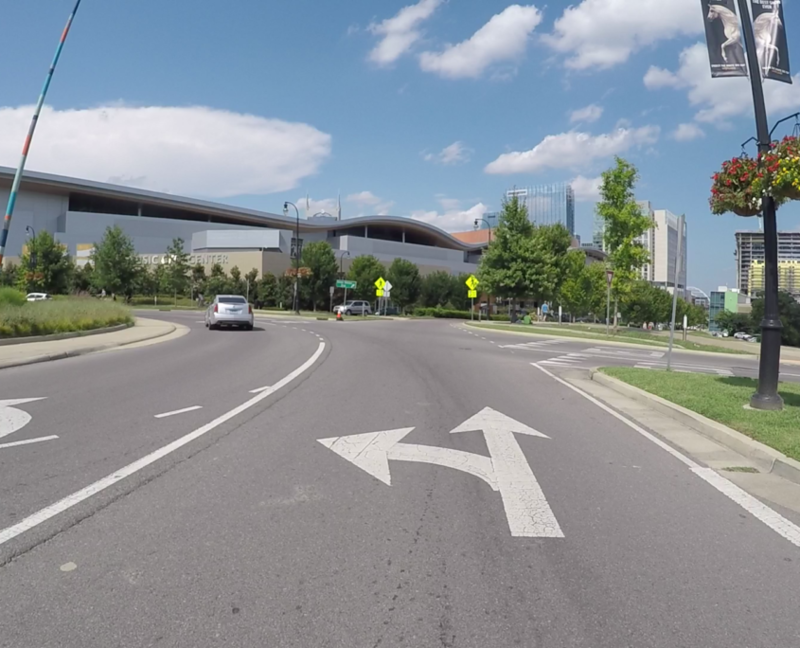 To be precise, I was in the middle of the lane, not the middle of the road (the latter would be the centerline). I was not wearing a backpack, only using a pannier on a rear rack. On a humorous note, do you see the Call Type? “PERSONS BOTHERING.” I don’t know which direction that’s supposed to imply, but it’s probably safe to say that it went both ways! My friend Alice Persons found it especially amusing. Culture of Speed. Every car commercial romanticizes the ideal of driving fast on the open road, unimpeded by other traffic. We live in a do-it-now world. We don’t like to be delayed. Cyclists are guilty of this, too, when they ride up on the right of a half-dozen cars waiting at a red light to get to the front. Lack of understanding. 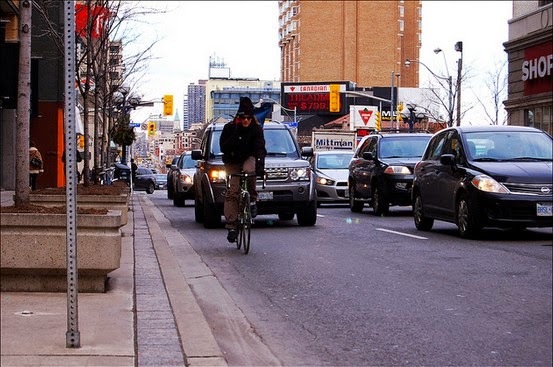 Most motorists don’t bike in traffic. 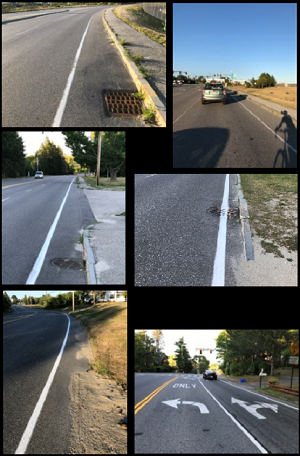 They don’t understand the consequences of riding on the edge: The close passing, insufficient buffer space, inconsistent available width, debris hazards, and lack of vantage around corners. What most people do know is that there’s some law about bicycles needing to be “as far right as possible.” Actually, that’s NOT the law anywhere in America. But people confronting you on the road are not in the mood to quibble. Unfortunately, not one person in 100 knows anything about the many exceptions such laws always have. No state’s traffic laws obligate you to endanger yourself for the convenience of another. Purpose of roads. 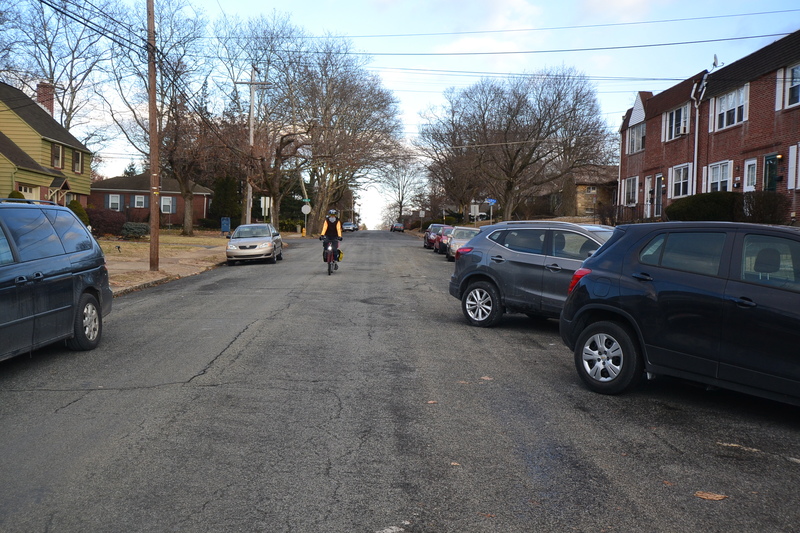 Most people believe “roads are for cars.” Most motorists remain oblivious to the fact that they are beneficiaries of both the Good Roads Movement and a concerted effort in the early 20th Century to redefine streets as places for cars rather than people. 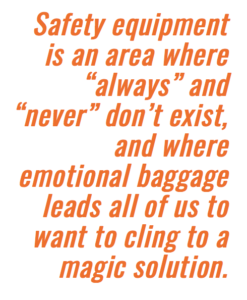 This effectively transferred the safety burden from drivers of fast, deadly vehicles onto people who were “foolish enough” to venture onto the street without the protection of a car. 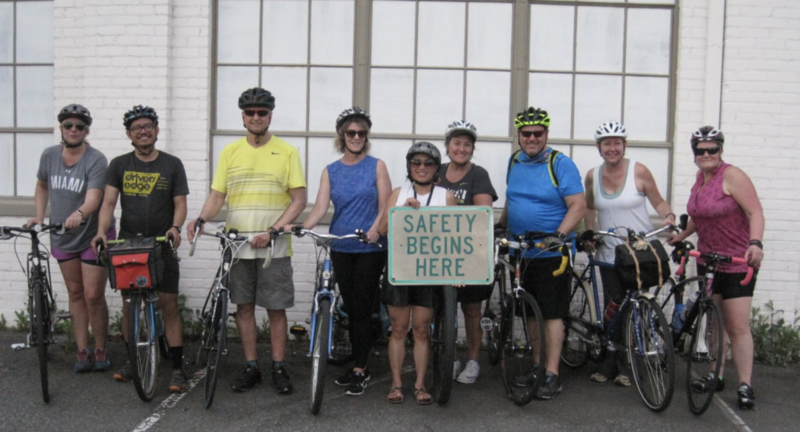 It has become “common sense” that “bikes and cars don’t mix” and that roads are intended only for cars, and pedestrians and bicyclists just need to be careful and stay out of the way in order to be safe. Purpose of bikes. When autos became ubiquitous in the 20th century, bikes were relegated to toy status. 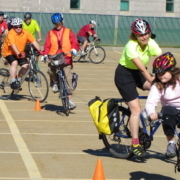 Still, adults continue to rediscover biking for fitness and recreation, and to a lesser extent for transportation. Unfortunately, our land use patterns and economy are still not well suited to bicycle transportation outside of urban centers. 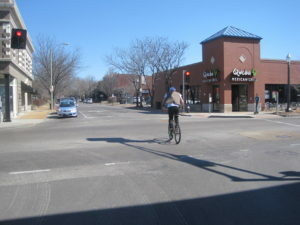 The bicycle is still largely seen by non-cyclists as recreation. 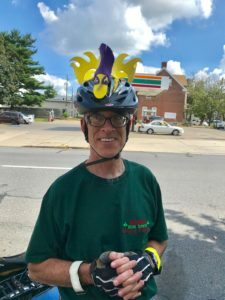 Bicycling for transportation is often seen as an undesirable last resort, unless you’re an enthusiast who does it by choice, in which case it’s still just a “hobby.” Not that that has any legal bearing on your right to use the road. Why should I have to change lanes when they could just move over? Don’t they have somewhere else to ride than on this dangerous road at rush hour? Isn’t it illegal to hold up traffic like this? They’re going to get hit! This can be hard at first. 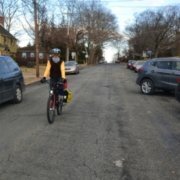 While the techniques we teach in CyclingSavvy work great for minimizing road conflict, there will always be motorists whose lack of understanding makes them want to “driversplain” to you that you’re doing it all wrong, or even what a terrible and selfish person you are. Ever notice how dogs bark when you walk by their yards? “Stay out of my territory!” When motorists honk at you just because you’re on the road, it’s the same thing. CyclingSavvy co-founder Keri Caffrey coined the term “territorial honking” to describe motorists who want to Make Sure You Know Just How Unhappy They Are that you’re in “their” space. 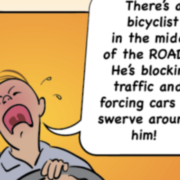 It can be frustrating, especially when you’re pretty sure you know more about bicycling in traffic than they do, especially after taking CyclingSavvy. 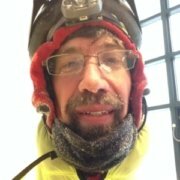 I’ve made good progress since I started biking to work 15 years ago. I manage to keep my cool most of the time, as long I’m not actually endangered by someone’s action, especially intentionally. I can count the number of times I’ve given the one-finger salute in the last half dozen years on, well, one finger. But even that’s too much. The ideal response is not to respond, unless you’re asked an honest question. As you may have noticed from my story, I’ve yet to achieve that blissful state of savvy nirvana. But I have managed to habituate myself to responding most of the time with a friendly “Hi!” and full hand wave, which maybe disarms them. It can be tempting to think that you can educate them. Don’t bother. That’s not what they want. They’re mostly sounding off because they had to slow down. It’s not socially acceptable to honk at other motorists, even when one motorist has to slow down for normal actions of others, such as waiting to turn left. Those situations are considered normal, in a way that a bicycle in the road is not, for all the reasons I listed above. And to some people, not being normal is apparently the greatest offense of all. Whatever you do, don’t escalate. This will not make it better, and could very well make it worse. What if you are stopped by police? Pull over, and respectfully discuss the situation. Know the law and be able to talk briefly about it. 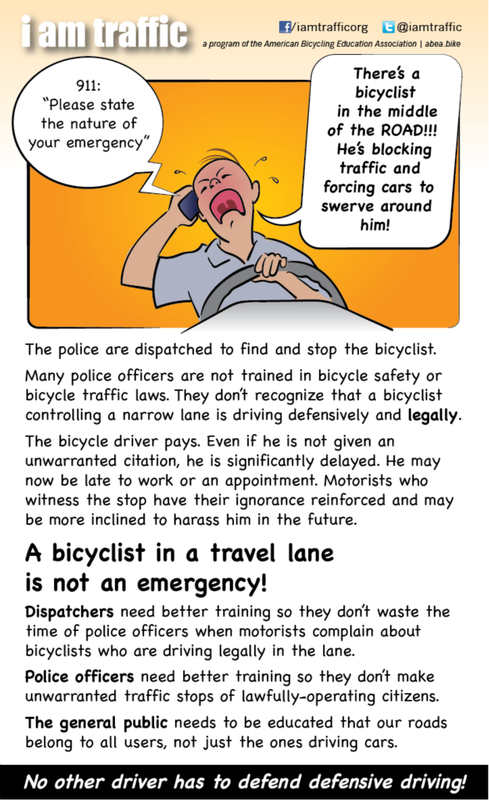 You probably know a lot more than the cop about bicycling, but don’t lecture. 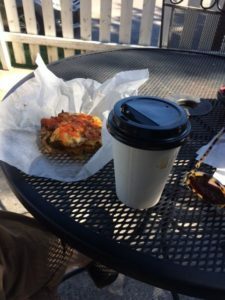 As lawyers say, the side of the road is not the place to litigate your case. Retired police officer Kirby Beck gives solid advice in this video. 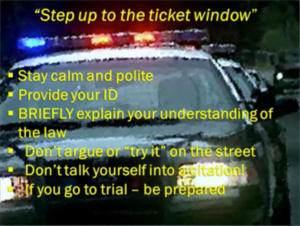 He describes how to report an incident–and you should, if you were endangered–and how to respond to an officer if you’re pulled over. 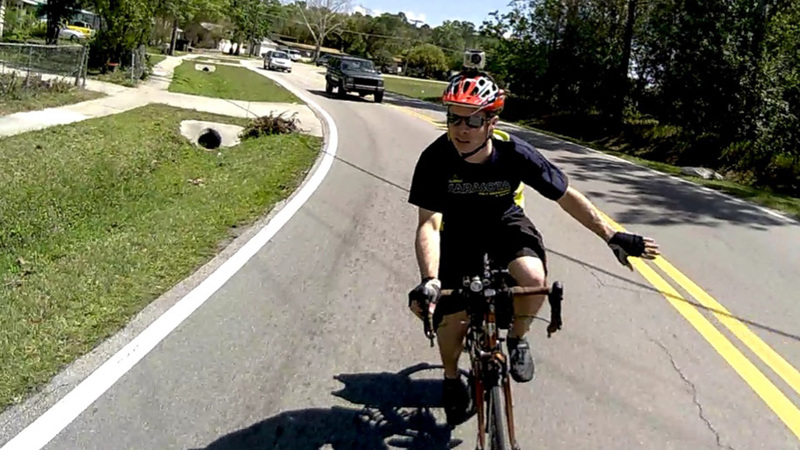 Bike lawyer Bob Mionske offers cautionary advice in How to Handle a Traffic Ticket. 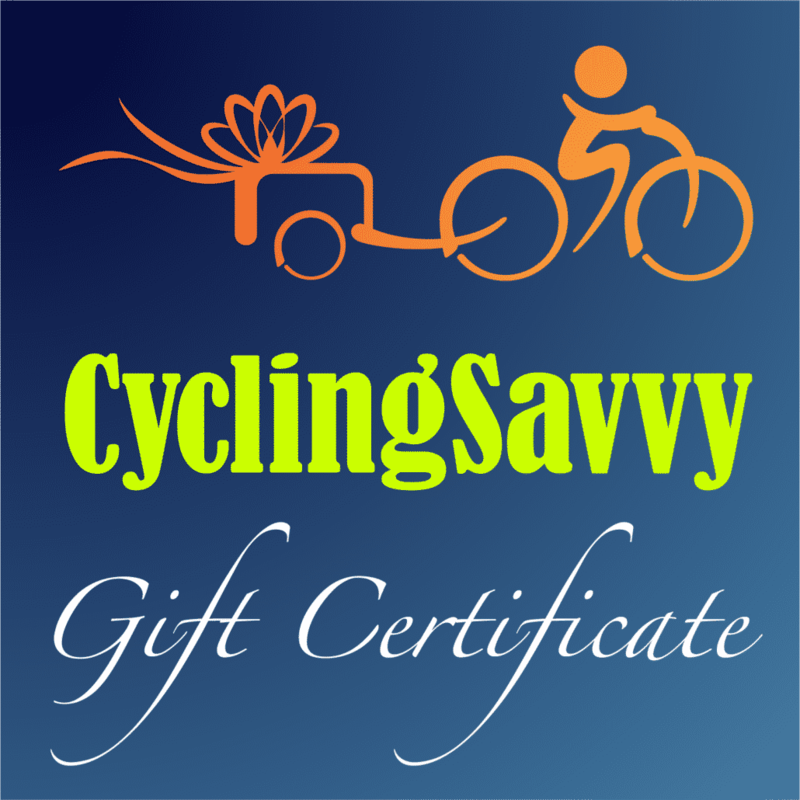 CyclingSavvy will make your cycling easier and less stressful. But unfortunately, you will occasionally encounter jerks, or at least misinformed individuals with strong opinions. On the rare occasions someone is rude, I always remember how I typically have no problems at all on the road. I hope that’s true for you, too. Enjoy the ride! Oh yeah, we had a great Slow Ride that night too! 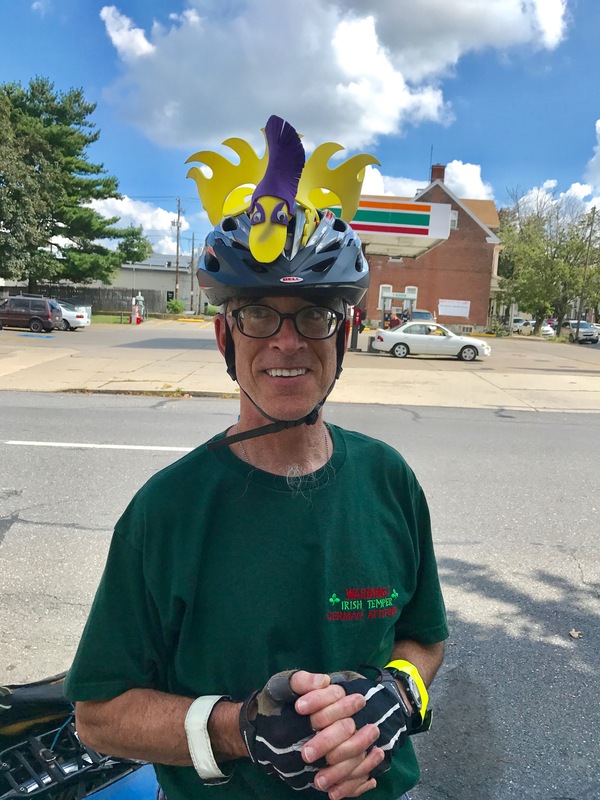 https://cyclingsavvy.org/wp-content/uploads/2017/09/bicyclist-in-road.png 260 400 John Brooking https://cyclingsavvy.org/wp-content/uploads/2018/05/cs-xlong-header-01.png John Brooking2017-08-30 11:30:292018-08-27 21:14:29911: Someone's Riding a Bike in the Road! The joy has left you. It’s too much work. You hop in your car instead. I know this routine because it’s happened to me. A LOT. Just thinking about preparing to leave for a ride was exhausting. Well! No pun intended, but I decided to break this cycle. From now on, I’d have a more “just do it” approach. I decided to test my new resolve with a weekend trip to Kansas City. 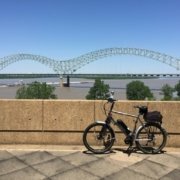 I was driving there and would take my bike on my car, but leave the car in a free lot and get around town on my beloved Frenchman “Pierre,” a vintage 1973 Peugeot Mixte. Riding Pierre would make my trip more economical, and let me enjoy KC in the best way possible. Before I left home, I ensured Pierre’s tires were aired up. I took only a basket, lock, lights and helmet. Nothing else! I bike in regular clothes. Travel light, that’s my goal. 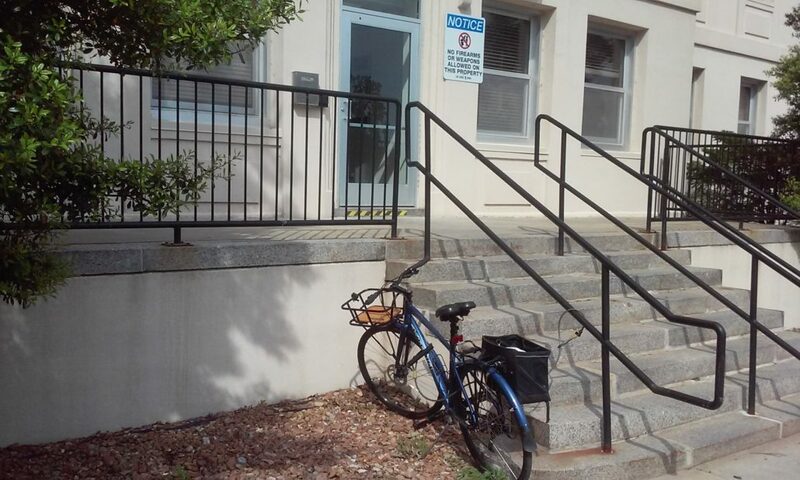 Prior to my trip, I asked my Airbnb hosts if there were bike racks in front of building. They couldn’t remember, but said I could bring my bike up to my loft. While I would have use of an elevator, this made me even more determined to travel light. 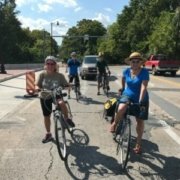 Biking around KC was easy. I stopped any time I wanted to enjoy views I would have easily missed in a car. On my last day I wanted to visit a highly recommended vegan bake shop. It was a little far but I didn’t care. The weather was perfect. I’d be able to bike off calories after I devoured pastries. With very little traffic, I felt like I had the roads to myself. I was just enjoying my time when the unexpected happened: A bolt on the pedal crank broke! Suddenly Pierre was unrideable. Yeah, right. Even if I had tools, would I have been able to fix Pierre? What to do? I remembered someone telling me that I could Uber a car that can carry a bike. Uber! I’ll Uber! I got my phone and ordered a car to come get me. I locked up Pierre to get him later. I didn’t need to order a special vehicle though it was available. In less than five minutes, my Uber driver arrived. Twenty-five minutes later I was in my car, picking up Pierre. Not once did I regret not packing “everything” in the event something happened. This was a small hiccup in a fun weekend ride. Over-planning for the worst could be the worst thing that happens to you on a ride. I ride more since I’ve stopped worrying about what I “should” bring on trips. I don’t even worry about what I wear. You’ll often see me in flip flops and a skirt. This has been a life changer! There are a few things I always bring: A fully charged cell phone, bike lights and a helmet. But everything is really not necessary. Most things I can get at my destination & leave there, or arrange to get later. “Anything is fixable except death,” my mom says. So true! These days, anything is a cell phone call away. OH! I made it to that vegan bake shop, with Pierre. He was resting comfortably on the bike rack ready to get back home. He has since recovered from his injuries and is back on the road. https://cyclingsavvy.org/wp-content/uploads/2017/09/monica.jpeg 450 450 Mónica Llorián https://cyclingsavvy.org/wp-content/uploads/2018/05/cs-xlong-header-01.png Mónica Llorián2017-08-09 12:00:012018-08-27 21:17:16The Art of "Just Do It"
It was a typical winter morning in Downtown Orlando. Clear, cool and sunny with normal rush hour traffic. Because it was cool, I was wearing my usual neon yellow jacket. I’m not obsessive about “hi-viz” clothes, but if I’m going to wear a jacket, I figure it may as well be a bright one. I’d just turned onto Rosalind Avenue, a one-way three-lane street with short blocks, lots of signalized intersections and a bike lane. I normally use the bike lane. Sure enough, as we reached the intersection, she turned right in front of me. Since I was expecting it, it wasn’t a big deal. I tapped my brake and no contact was made, but she missed me by only about a foot. An untrained cyclist might not have had the same outcome. 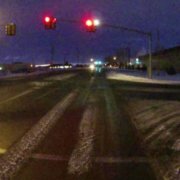 The point of this story is not to illustrate the fairly common “right hook” conflict, but why this particular driver did something so obviously stupid. She had no other person or vehicle to pay attention to for the few seconds leading up to our conflict. I was exceptionally conspicuous in my jacket. As it was a one-way street, she had no concern about on-coming left turns. There were no vehicles waiting at the cross street. I was the only thing in the world she had to avoid, and she failed. I can guess at her thought process. Perhaps she misjudged my speed. Perhaps she assumed I would yield. Or perhaps she was so preoccupied that she was not paying attention to anything outside her lane. Whatever. One thing was clear: Even though I was highly conspicuous, I was not relevant enough for her to make the right decision. The difference between frustrating routine conflicts and a stress-free ride. 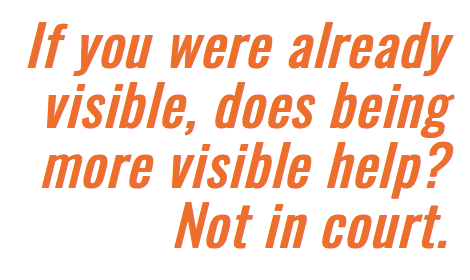 You can dress to be highly conspicuous and yet be completely invisible to a motorist who needs to see you. See how this cyclist in hi-viz is invisible to the driver about to turn left? 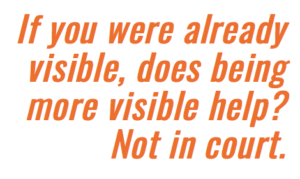 Most cycling safety proponents (and sellers of gizmos) will tell you all about how to be more visible and conspicuous. 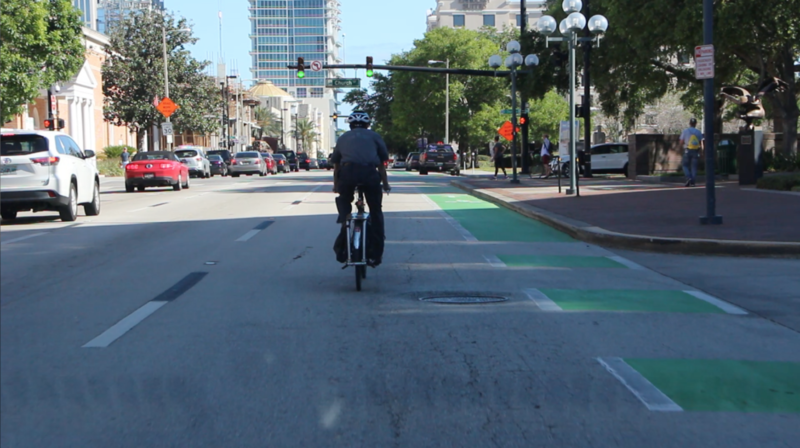 We hear from lots of cyclists who say they are “doing everything right” and being as conspicuous as possible. Yet they also complain about having too many close calls. If you’re having close calls, check out the relevance component. CyclingSavvy shows you strategies that will make you as relevant as possible. You have the power to banish frustrating routine conflicts and enjoy a safer, nearly stress-free cycling experience. Relevance makes all the difference. Last month, though, I had to conduct business that was not only outside of my radius but accessible “only” via an interstate. Figuring out how to get there by any means other than my car was so complicated that I almost threw in the towel during the route planning process. But Monday morning dawned beautiful and beckoning. With school out for the summer, I had time and was up for the challenge. 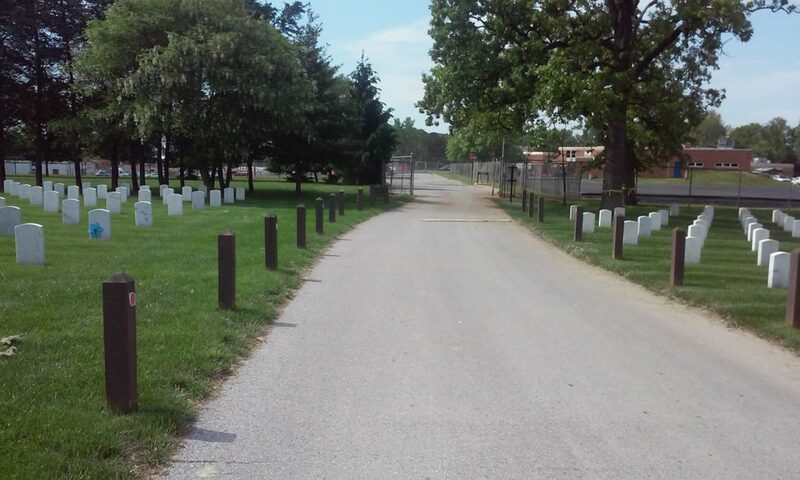 I settled on a route that took me through a cemetery and relied on either A) a gate between the cemetery and my destination being unlocked; or B) me locking up my bike on the cemetery side and scaling a fence to the medical center on the other side that was my destination. 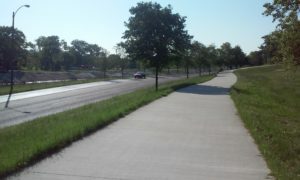 My adventure included using a greenway paralleling a busy St. Louis arterial road. This road has four lanes with a speed limit of 40 MPH. This means that many if not most are driving 45 MPH, and some upwards of that. 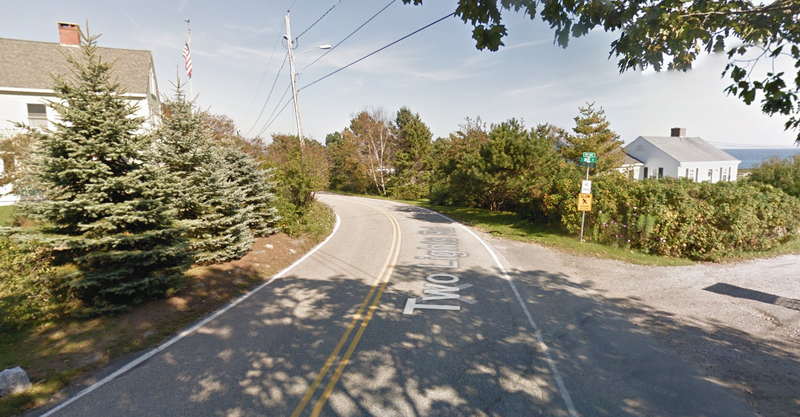 A number of small streets intersect the stretch of greenway I used.
. . . but motorists on the arterial road do not. 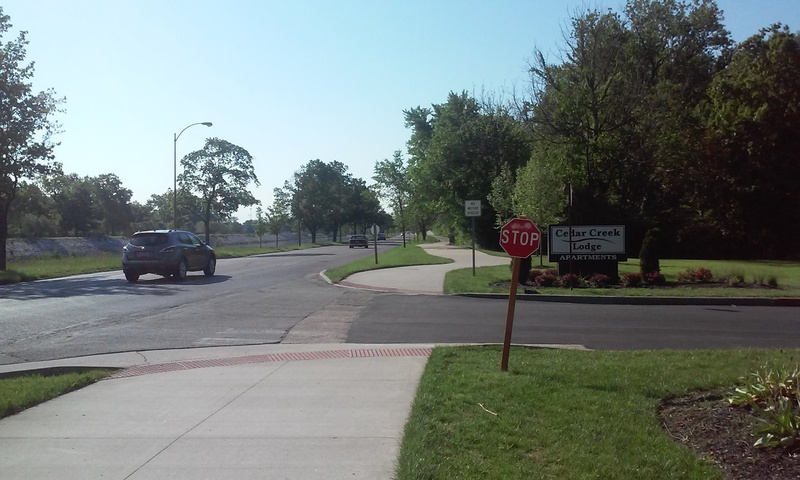 As a savvy cyclist I know that greenway stop signs are NOT to be ignored. 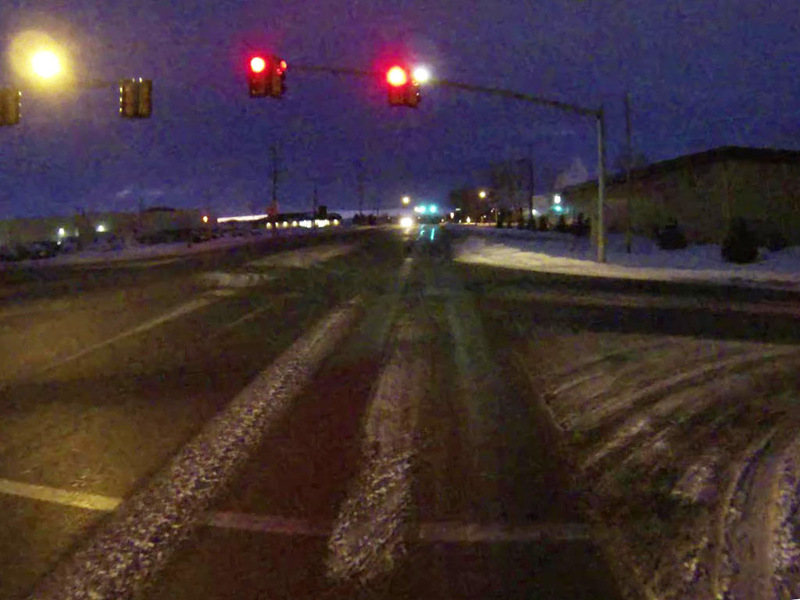 For my safety I scanned ahead, behind, and to my right before proceeding into the intersection. Given the speed of other traffic and sight lines, I felt like I could never look enough to be completely satisfied. I might as well have been a Bobblehead! By the time I confirmed that there were no oncoming motorists who might suddenly decide to turn left, I had to look behind me again to assure there were no overtaking motorists who might suddenly decide to turn right, and vice versa. Traffic was fairly light. The workload of doing this with rush hour traffic would be much greater! 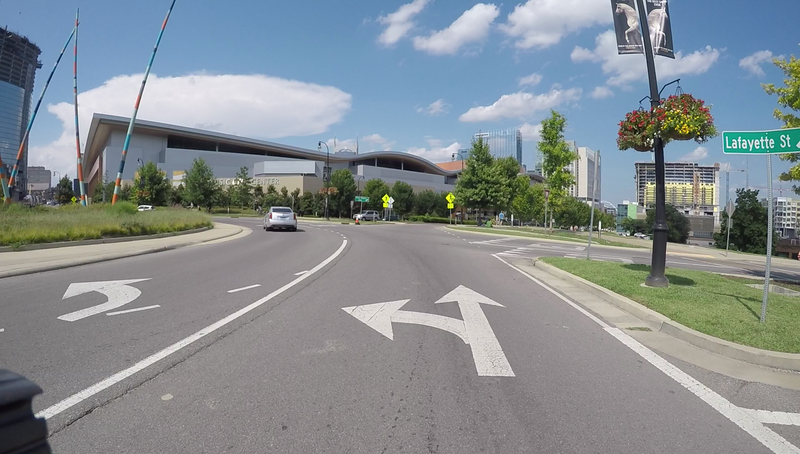 The greenway between intersections was perfectly pleasant, but the work required at intersections was exhausting. 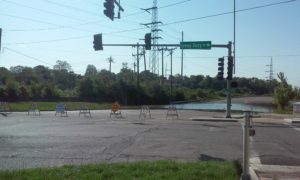 I had to reroute my trip due to a section of road being underwater. Thank goodness for smart phones! Hallelujah! The gate was open. No need to scale fences! 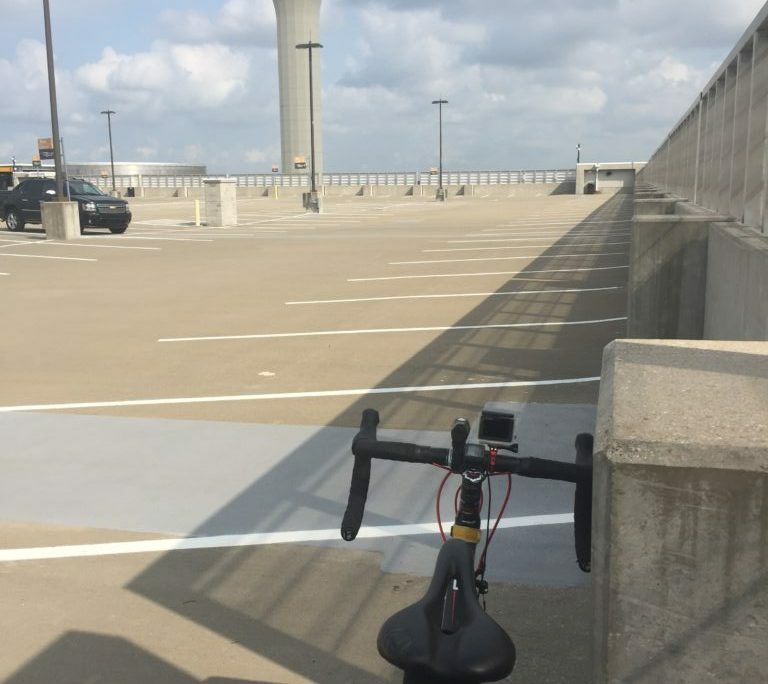 It was nice to have my bike with me, as the building I was headed to was on the opposite side of a very large medical compound. It occurred to me that riding my bike through the gate was a bit of a gamble. What if I returned to a locked gate? I’d be SOL, or at least stuck planning a long and complicated reroute. Mission complete, I retraced my route through the large medical campus. Fortunately, the gate was still open, making a smooth start for my return voyage. 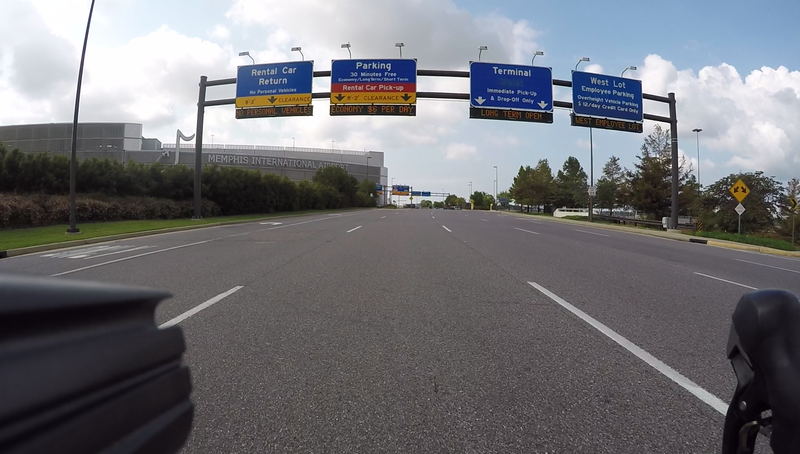 If I were to make the trip by bicycle regularly, I would ask about the gate — i.e., are there set times when it’s open? If not, could there be? My trip home was uneventful. After my discomfort on the outgoing leg of the trip, I chose to forego the greenway on my return. Being part of traffic and following the rules of movement is just so easy and straightforward! The trickiest bit was after the four-lane road became only two lanes. I was on the two-lane section for just under a mile. I prefer not to have motorists stacked up behind me, so I pulled onto the shoulder twice and stopped to let groups of overtaking vehicles (AKA platoons) pass. It only took a few seconds, and then I had this road–with its 40 MPH posted speed limit–all to myself between platoons. I arrived home tired but happy to have made the 20-mile trip by bicycle, rather than resorting to the car. It took me a bit over an hour each way. Realistically, that is time that I can’t afford every day, though recent timely discussions on e-bikes make me wonder how having a little boost would change the equation. 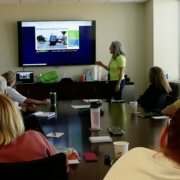 The full CyclingSavvy Course INCLUDES Truth & Techniques (classroom session), Train Your Bike (bike handling) session, and our signature on-road experience — Tour of Waltham. 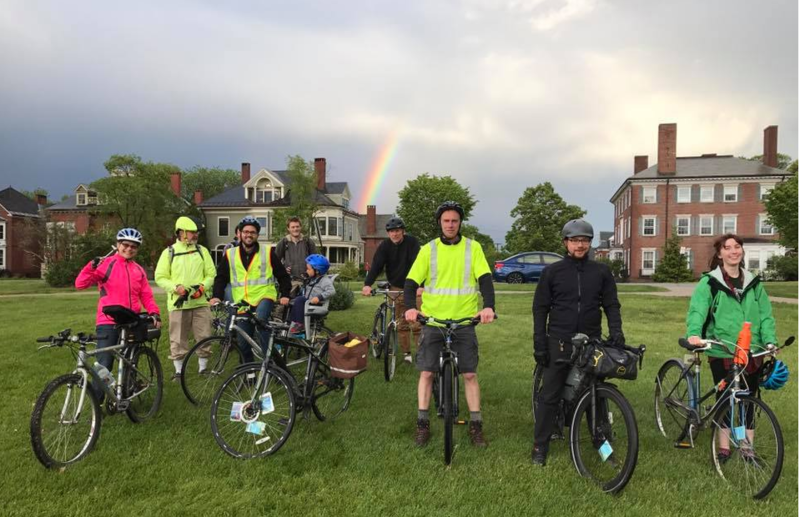 The Tour of Waltham is an experiential tour of our city’s roads. 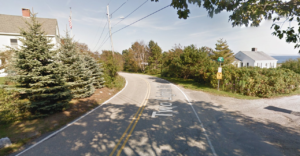 The course includes some of the most intimidating road features (intersections, interchanges, merges, etc.) a cyclist might find in his/her travels. The students travel as a group, stopping to survey and discuss each exercise location. After observing the feature, discussing the traffic dynamics and the best strategy for safe and easy passage, the students ride through individually and regroup at a nearby location. The ticket below is for the full three-part course, including the Tour of Waltham session.